Wellness combines seven dimensions of well-being into a quality way of living. Overall, wellness is the ability to live life to the fullest and to maximize personal potential in a variety of ways. Wellness places responsibility on the individual; it becomes a matter of self-evaluation and self-assessment. Wellness involves continually learning and making changes to enhance your state of wellness. Intellectual wellness involves unbridled curiosity and ongoing learning. This dimension of wellness implies that you can apply the things you have learned, that you create opportunities to learn more, and that you engage your mind in lively interaction with the world around you. Emotional wellness implies the ability to express emotions appropriately, adjust to change, cope with stress in a healthy way, and enjoy life despite its occasional disappointments and frustrations. To remain well, physical wellness requires that you take steps to protect your physical health by eating a well-balanced diet, getting plenty of physical activity and exercise, maintaining proper weight, getting enough sleep, avoiding risky sexual behavior, trying to limit exposure to environmental contaminants, and restricting intake of harmful substances. Social wellness endows us with the ease and confidence to be outgoing, friendly, and affectionate toward others. Social wellness involves not only a concern for the individual, but also an interest in humanity and the environment as a whole. Preparing and making use of your gifts, skills and talents in order to gain purpose, happiness and enrichment in your life. Occupational wellness means successfully integrating a commitment to your occupation into a total lifestyle that is satisfying and rewarding. The development of occupational satisfaction and wellness is strongly related to your attitude about your work. The quality of today's environment has a direct effect on personal wellness. To enjoy environmental wellness, we require clean air, pure water, quality food, adequate shelter, satisfactory work conditions, personal safety, and healthy relationships. The sense that life is meaningful and has a purpose; the ethics, values and morals that guide us and give meaning and direction to life. 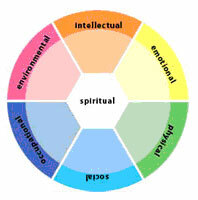 Spiritual wellness is a search for meaning and purpose in human existence leading one to strive for a state of harmony with oneself and others while working to balance inner needs with the rest of the world.